You have just arrived at a regional hospital to retrieve a 35-year-old male who has had ECMO initiated. As you receive handover you notice that cable ties are missing from the ECMO circuit junctions. All of a sudden the tubing ruptures at the site of one of the unsecured junctions. Q1. Why is the location of the circuit rupture important? Circuit rupture is a breach in any part of the circuit that results in blood loss from the circuit or air entrainment into the circuit. Which of these effects occurs depends on whether the site of the breach is pre-pump or post-pump. During pump operation, the pre-pump-head region of the circuit has negative pressure. Any breach will result in rapid air entrainment that will stop (“de-prime”) the pump causing loss of ECMO support and potential massive air embolism. On the other hand, the post-pump-head region of the circuit has positive pressure during pump operation. Any breach will result in forceful rapid blood loss until the breach is rectified, the pump is stopped or the patient has completely exsanguinated. Figure 1. 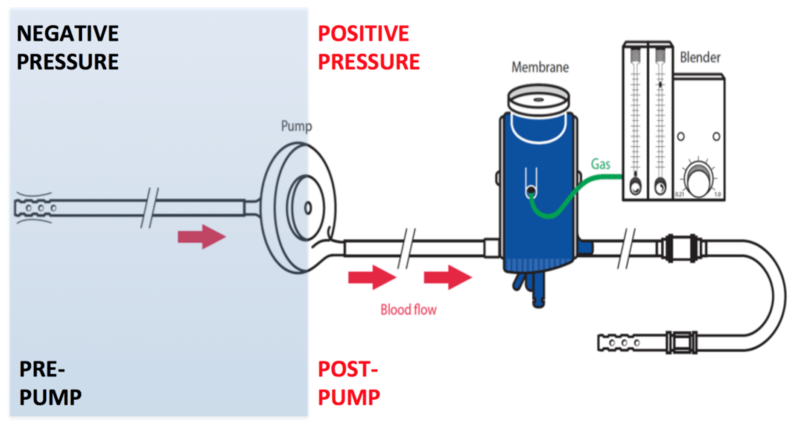 Pre-pump (negative pressure) and post-pump (positive pressure) circuit regions. Q2. What are your immediate actions if the location of the circuit rupture is PRE-pump-head? Clamp circuit and turn off pump. Apply a proximal clamp on the access cannula(e) and a distal clamp on the return cannula. The proximal clamp prevents bleeding from the ruptured circuit. The distal clamp prevents ongoing air embolism and “back bleeding” (retrograde blood flow) when the pump stops. Call for help. Contact ICU Consultant and ECLS Coordinator. The main difference between VV and VA ECMO in this circumstance is that in VV ECMO additional ventilatory support is the priority during the emergency response, whereas additional circulatory support is the priority in VA ECMO. Q3. What are your immediate actions if the location of the circuit rupture is POST-pump-head? If an open tap is the cause of the circuit rupture, it may be possible to rapidly control bleeding by securing the open tap manually and covering the breach. Following this, call for help and review the patient. If bleeding is not controlled (e.g. if the tubing has completely separated at the site of a junction) them immediately clamp the circuit and turn off pump. Apply a proximal clamp on the access cannula(e) and a distal clamp beyond the rupture on the return cannula. The clamps primarily prevent bleeding from both the access and return sites. Repair breach if possible. Unless it is a simple tap or connection this will generally involve an immediate circuit change. 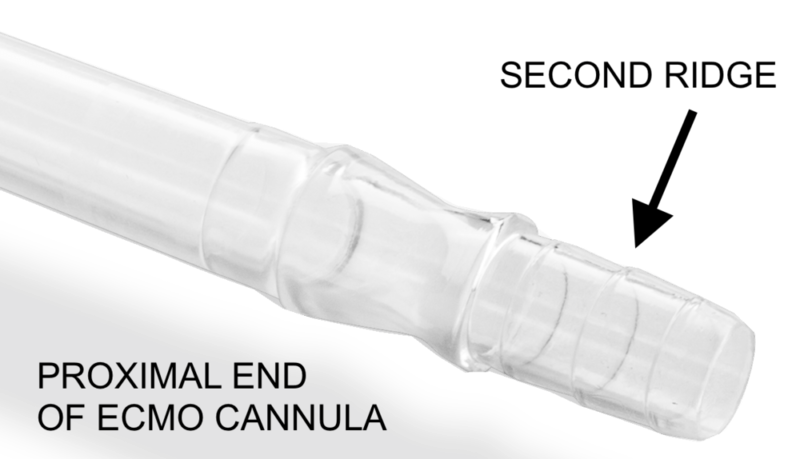 If the return cannula or part of it is damaged, recannulation is required (see Everything ECMO 010). Again, the main difference between VV and VA ECMO in this circumstance is that in VV ECMO additional ventilatory support is the priority during the emergency response, whereas additional circulatory support is the priority in VA ECMO. Q4. What are the important causes of ECMO circuit rupture? Q5. How is ECMO circuit tubing secured at the Alfred ICU? All connections are secured with cable ties. Figure 2. The proximal end of an ECMO cannula showing ridges for connection. Figure 3. 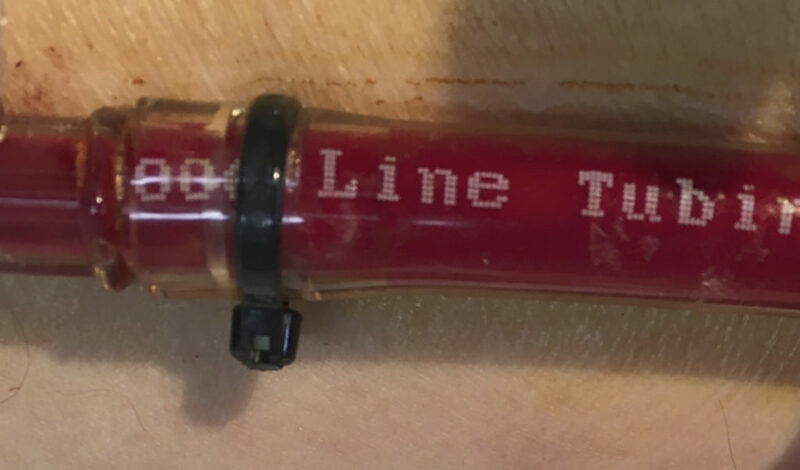 Cable tie correctly place over connection between ECMO cannula and circuit tubing.